One of the many joys of birding in other countries is spending time with local guides. Whether it’s driving through the towns or bumping along on a back road, for a short, sweet time we are receiving the gift of a glimpse into their lives. It was originally called “Land of the Hummingbird” by the South American Lokono people…and hummingbirds still grace the rainforests. Some of the most beautiful hummingbirds in the world live here. And there are a lot of birds on this tropical island, 460 different species. 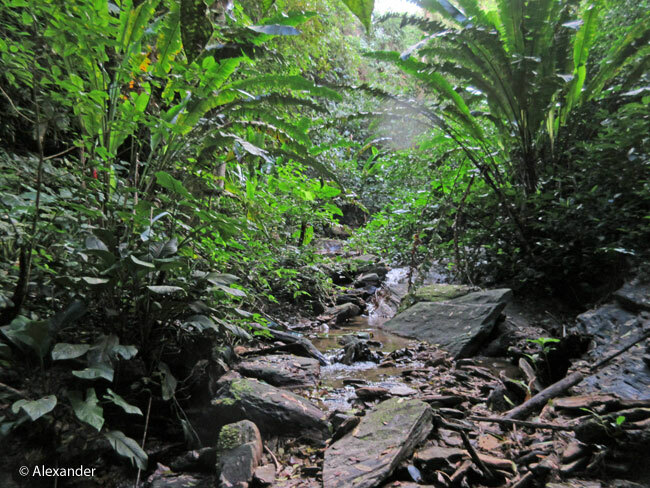 During our six days in Trinidad, our modest accommodations were located in a mountain rainforest eco-lodge. Asa Wright Nature Centre. For us, every day was about finding the birds. Some days the guide drove a few of us into town, visiting birding spots like sewage ponds, swamps, and an old abandoned army base. I realize that doesn’t sound glorious, but it was. 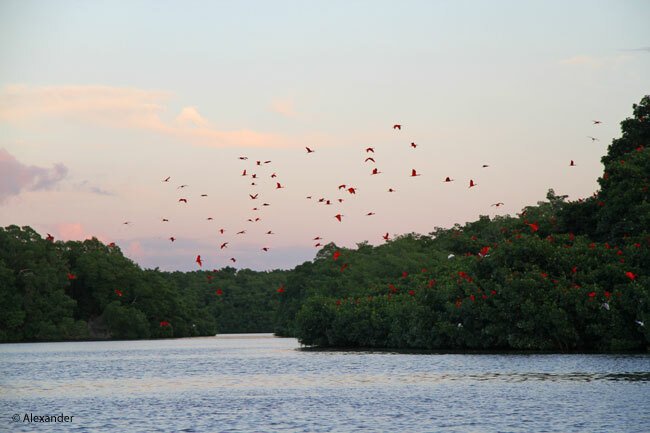 One afternoon we went to the Caroni Swamp, a 12,000-acre mangrove wetland famous for the nightly arrival of huge flocks of scarlet ibis. That was magical. And I also loved cruising the back roads, not only for the panoply of exotic birds, but to see native Trinidadians in their daily routines. Some of the scraggliest trees were the sites of dozens of colorful birds. 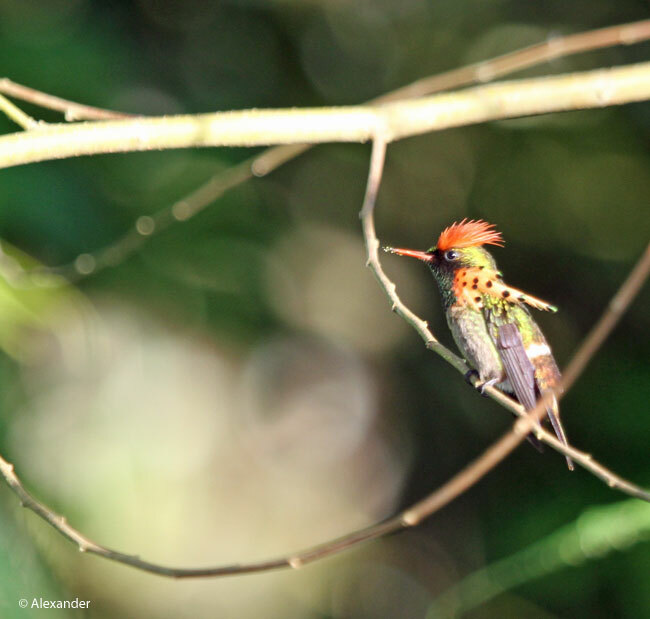 We watched a tufted coquette, one of the tiniest and showiest hummingbirds in the world, hassling a much-bigger owl. 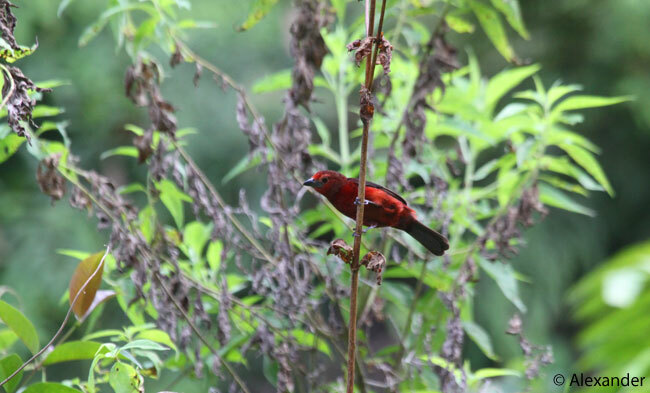 There were often tanagers everywhere you looked. 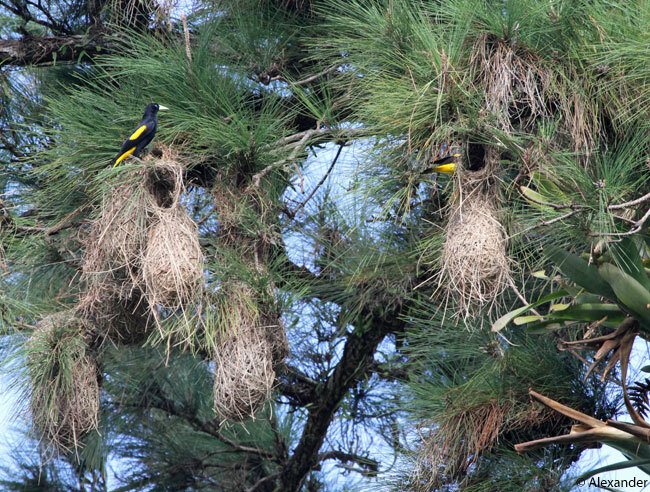 In a residential neighborhood on a mountainside we watched yellow-rumped caciques among their needle residences, while squawking macaws flew by. 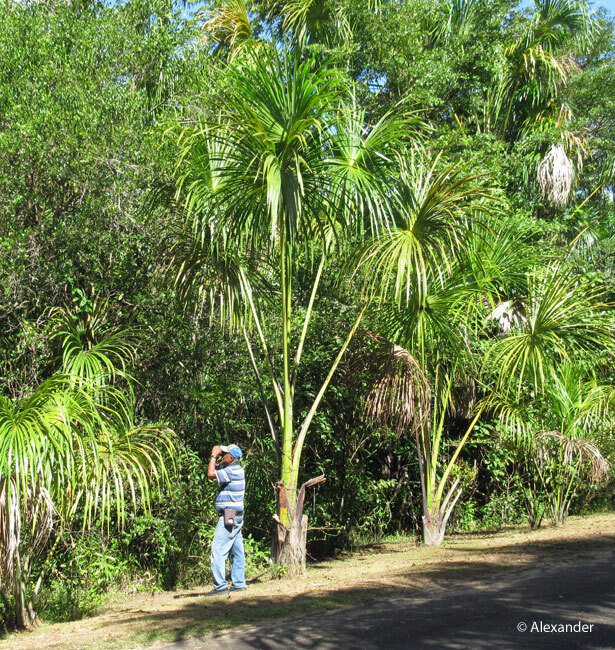 We were birding among cacoa trees when a Rastafarian silently walked by extending the two-finger peace symbol. 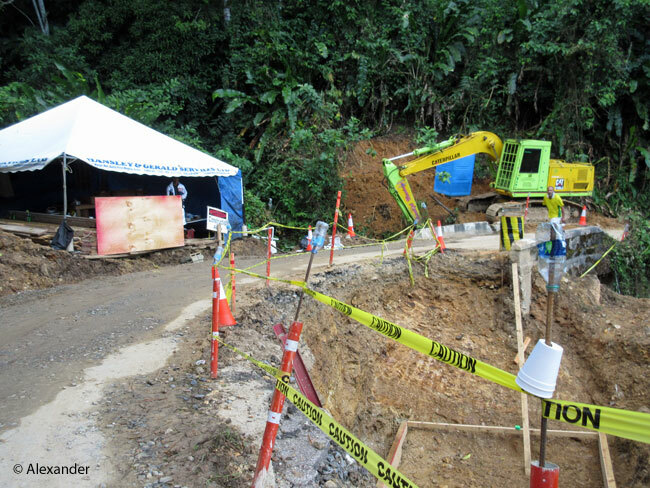 This is a construction site near our lodge, we passed it at least twice a day. They have perpetual wash-outs here, during heavy rains. When we weren’t busy trying to spot a bird, one or another of us in the group would ask our guide questions about the country; school system, local or national government, or more personal questions. 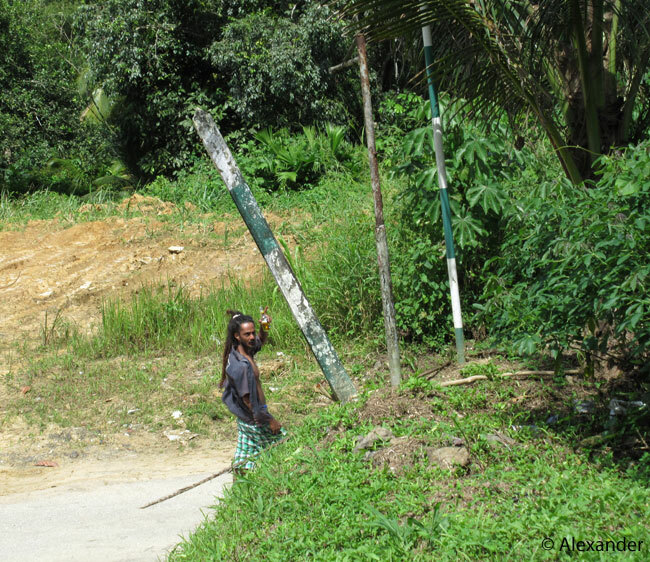 Some guides like to tell the local folk stories about certain trees or birds. We had different guides every day while in Trinidad, and they all revealed different stories. One guide often pointed out the crops we were looking at, how the product was used, how you ate it and what it tasted like. He liked to cook so he would tell us how to fix it and flavor it. 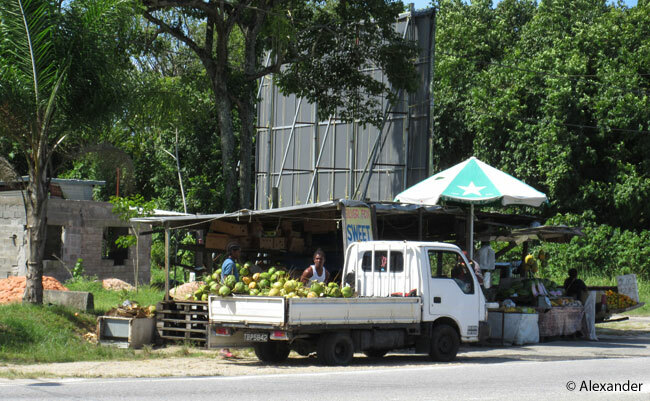 While in a traffic jam, one guide explained they have a lot of traffic in Trinidad because it is so cheap to drive a car, fuel costs almost nothing. On top of being excellent birders, as I often point out, guides are fluent in many languages, knowledgeable about the science of birds, and savvy about the biology and botany of the area. What a gift it is to drive through a foreign country, listening to a person tell about his country and its history, his friends and family, his surroundings. In Trinidad it was always men who were the guides, but I was happy to see a few women naturalist trainees at the Asa Wright Nature Centre. We strive to establish a comfortable and productive life, connect with loved ones and neighbors, and work through our troubles, our hopes, and our fears. What an amazing experience you had! All those beautiful birds, and a completely different culture to learn about. Wonderful photos. Thanks for sharing. It’s always interesting and enlightening to learn a new culture, and I’m glad I could share it with you, Anneli. Thank you for stopping by. All the difference no matter the type of tour. Getting to know the people and their daily lives is such a gift. As to the birds…460 species? It must have been like paradise found for you and Athena. So much beauty in these winged creatures. I agree, Sue, local guides make all the difference in a trip. We work them into the travel budget as a high priority, do with less expensive restaurant meals, etc. Many thanks for your visit and comment today, I think you are on an exciting adventure yourself. Have fun! Gorgeous colored feathers on the honey creepers. Birds of paradise are spectacular too. This gives me the opportunity to plug a book, Feathers: The Evolution of a Natural Miracle by Thor Hanson. He is witty and erudite. Makes wonderful and fascinating reading. I’m glad you liked the honeycreepers and Trinidad birds, Sherry. I loved those first two photos and you never let down after that. I really enjoyed my little trip and all before work! 🙂 Have a wonder-filled weekend, Jet. So happy to know you had a warm and tropical send-off to work this morning, Janet — many thanks for your visit and kind words. 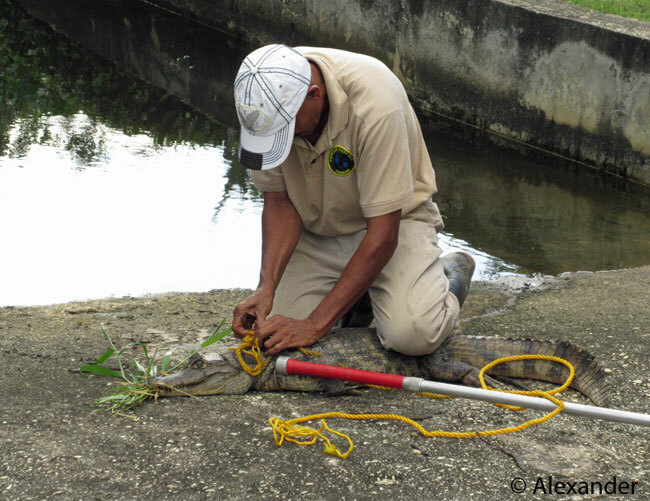 Yes, it’s a bit of a secret down there in the southern Caribbean. It has less infrastructure for the big cruise ships, but just as much sunshine and beauty. Happy to take you there today, John — thanks so much. I loved the birds and the way you enjoyed the culture as well. This is going on my bucket list along with Belize and Costa Rica. Thanks for the armchair look at a country most of us know little about. Thanks for this glimpse into a beautiful and interesting place! Such colour and variety – the hummingbirds are wonderful, and the tiny tufted fellow is a real sight. I enjoyed reading about the guides and the background to island life there. Travel is an education, broadens the mind, and sharing your travels is a positive contribution. Oooo, I’ve always wanted to go there. Beautiful photos, as always. I’d never heard of these birds, either. Scarlet ibis? Wow! Wow, so many gorgeous birds!! Thank you for sharing, Jet. Thank you, Patty Anne, I’m really glad you enjoyed the birds in Trinidad. So many beautiful birds in that country. Thanks for your kind words. Heartwarming!! All these birds and your experience. I have to think over my opinion because I often do everything on my own. But you’re right Jet, it’s better to have a guide. More Informations, better places for birding and renting a guide supports the economy of the locals as well as nature conservation. It is really fun to tag along with a local, and they make it easier for us foreigners to get around and spend our time doing the most fun and beautiful things, instead of getting lost or missing out on some of the rare finds. I’m glad you enjoyed Trinidad today, Simone, thanks so much for stopping by. Oh and there’s nothing like the tropical countries to bring out the bold colors. Glad you enjoyed the colorful adventure today, Jo, thanks very much. Happy to spread your good works! 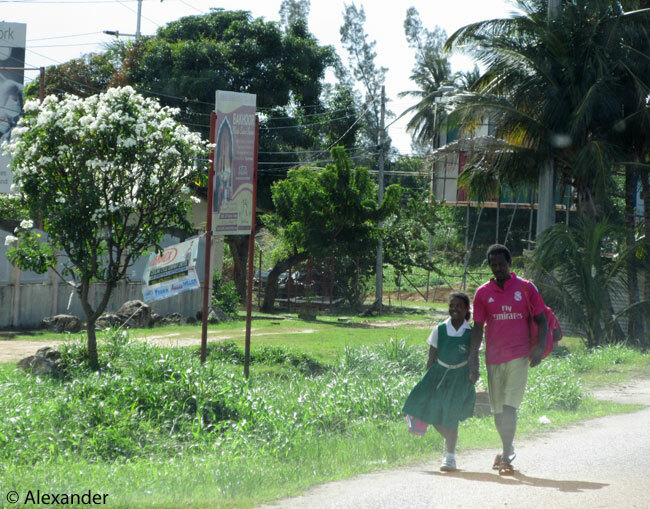 No matter how much color there is in a tropical country, the local guides just add that much more color. Glad you enjoyed the skip to Trinidad today, Jan, many thanks. Oh my goodness, what a magical trip. When I check out the reader in WordPress, I always view your post last because I know there will be lots to see and learn. Thank you Jet for the Trinidad journey today. Such a wonderful sentiment, Sharon, thanks so much. What a joy to have you join on my Magic WP Carpet today, for a visit to Trinidad. Gorgeous birds, beautifully captured! 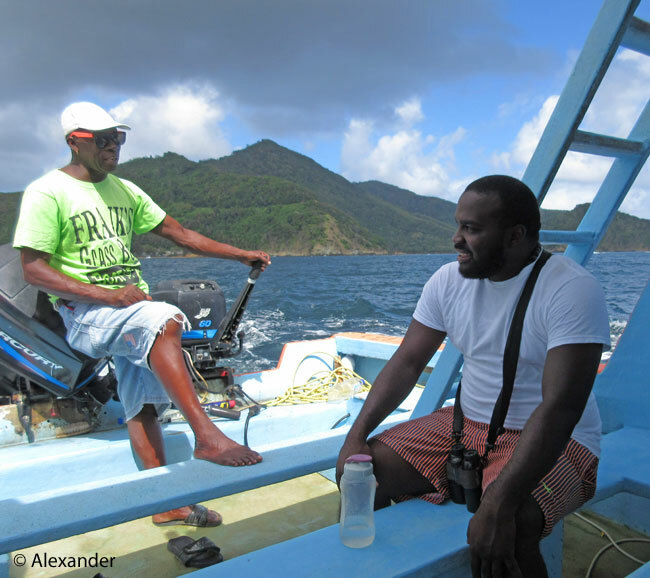 Thank you for sharing the stories and adventure of Trinidad. Yes, you’re right, Amy. With the lushness of the forest and the colorful pods and flowers, there is a lot for the human eye to follow. But what a great sight wherever one looks. Great to hear from you, and as always, a pleasure. Turquoise and cobalt for bird colors are quite an eyeful. Glad you enjoyed the colors of Trinidad, Beth, thank you. The vivid color of these birds takes my breath away. Fabulous post! It’s like having two gardens everywhere you look; one with all the flowers and another with all the colorful birds. Enjoyed your visit today, Eliza, as always…thank you. Beautiful photos of your trip, Jet. We have a friend form Trinidad and I love to listen to his accent when he speaks. “Land of the Hummingbird” is my kind of place! The photographs are so beautiful. Thanks for sharing! I love that original name too, Jill. And hummingbirds, well, they’re everywhere…wow. Thanks for your visit, much appreciated. Lately it almost feels as though we live in a rainforest! But we certainly don’t have the variety of brightly, almost neon colored birds you’ve introduced in this post! What a joy it must be to see these wonders and to get to know other cultures and peoples. I truly do enjoy joining you and Athena in your amazing travels. And what a joy it is to have you along on the ride, Gunta. Thanks for joining, my friend. What an amazing adventure you describe Jet, from the people to the extraordinary beauty of the land and it’s birds. A real treat to be taken along! I’m delighted you enjoyed the Trinidad adventure, Belinda. Thank you for your kind words and visit today. I’m glad you enjoyed the trip to Trinidad and the birds there, HJ. With your residency and birding experience in South America, I can see you would have a good idea of the habitat, it is much like So. Amer. I read that Trinidad was once part of that continent, and is on the same continental shelf. Thanks so much for your visit, always a treat. I am happy (I’m smiling as I type, Alastair) you enjoyed the Trinidad post, and absorbed all the best parts to savor. Interesting share, too, on your weaving classes and the term “natural colours.” We spend enough time outdoors, both you and I, to see earthy colors can be so bright and bold, even outrageous. The scarlet on those ibis was astounding. They come in to roost at night, in flocks by the hundreds, and fortunately this is sunset and that lovely sunset glow enhanced the scarlet even more. I love the name of the tufted coquette, too, so perfect. Those cacique nests were high off the ground, higher than the roofs of the houses. But the birds are big (gull size) and noisy, so not hard to find if you know what to look for. Really really fun to share it with you, Alastair, thanks for your great comment. Hi Jet, that Tufted coquettes something else and I thing this post might just inspire us to visit Trinidad when we get the opportunity. Thanks for the information and we will contact you for suggestions etc. when we get the time to arrange a trip. How marvelous to experience this trip with you vicariously. 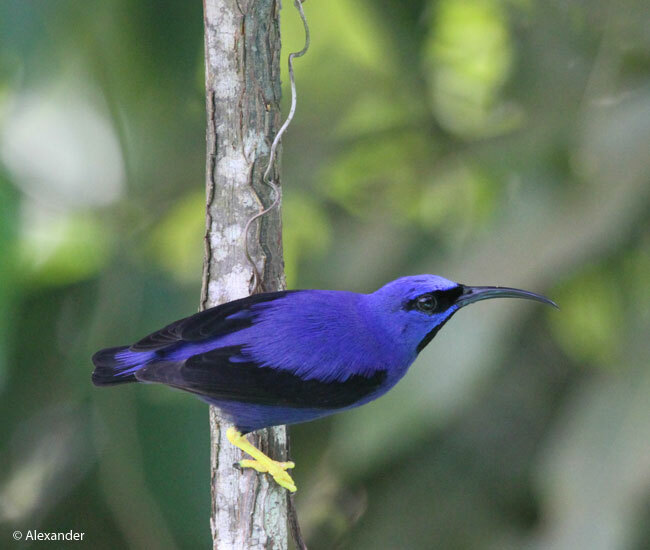 I love the Purple Honeycreeper – just an incredible bird!! Reminds me of the feeling I had when we spotted a Red-legged Honeycreeper in Panama. Hi BJ. 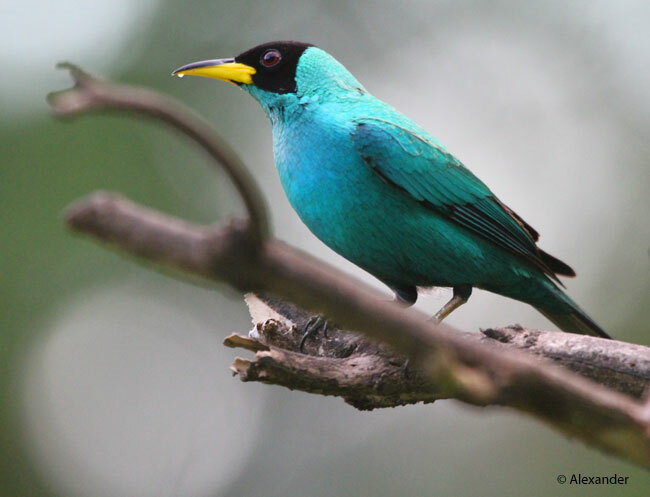 The purple honeycreeper was much like the red-legged, size-wise. And oh, that cobalt color is extraordinary. Happy I could share the Trinidad finds with you, thanks for stopping by. Aloha Bill – thank you for stopping by, I’m glad you enjoyed the Trinidad visit. I’ve generally thought of Trinidad as a potential scuba destination, now I see there’s yet another reason to visit. Jet, thank you for the way you framed the relationship and “value proposition” of local guides for bird watching. This definitely motivates us to get a guide next time we are in an area with a plethora of birds. What magnificent birds in Trinidad! We both love humming birds and we used to get daily visits from them when we lived in Granada, Nicaragua in our little courtyard. The purple honey creeper is amazing. A few of the best bird experiences I have had were flamingoes en masse in Namibia taking flight, a nesting island for frigates in Panama and a bounty of birds in Cuba in a swamp area. Alexanders photos of the birds are quite magnificent. I am happy to know you and Ben will consider using a guide on an upcoming adventure, Peta. It’s a wonderful way to connect with a local, find incredible birds, and contribute directly to a local. I’m glad you enjoyed the birds of Trinidad, and loved hearing about some of your best bird experiences. Flamingoes and Frigatebirds are some of my favorites, and when they’re in large flocks it is a breathtaking spectacle. I once saw Lake Baringo (Kenya) covered with flamingoes, a pink carpet, a sight I still cherish. It was far from camp and we never would’ve found it without the guide. Many thanks for your lovely comment and visit, Peta. 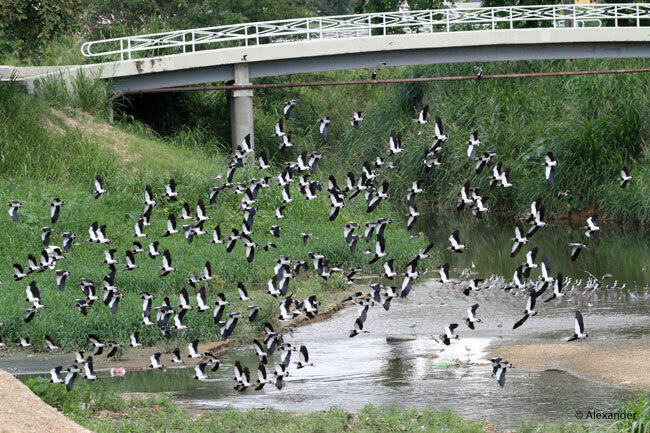 Hi Amy, it is a great pleasure to bring you the colors and birds and sights of Trinidad. I am very glad you enjoyed it, and thank you for your kind words. Cheers my friend — and have a great week. I’m delighted you enjoyed the sights of Trinidad, Katy, and I know you and your boyfriend would enjoy the birds there too. Thanks so much for your wonderful comment. Wonderful to have you visit, Janet, and for me to have gleaned some of France, through your recent post. When we took Caribbean Airlines from Trinidad to Tobago, their logo is a hummingbird. I thought of you when I saw it. Thanks so much for your kind words, and great visits. Love this post. It “sounds” lyrical and peaceful, joyful and relaxed…and there are steel drums playing softly in the background. Thanks for sharing the spirit! Aloha to you, Nan, and many thanks for visiting me on a different tropical island across the globe. I’m happy to have shared the Trinidad spirit with you. Sending love and mahalos. Honeycreepers – oh my Lord, they are lovely Jet! Thank you, Kendall, I’m glad you enjoyed this visit to Trinidad. vegetation reminds me a little of home. Great photos Jet! Thanks very much, ACI, it was fun bringing you to Trinidad, thanks for stopping by. You seemed to have slowed your usual pace down on WP, on your site; please know I am hoping you are doing okay with other pursuits, and am thinking about you with warm wishes. This must be a birder’s paradise. Thank you for the lovely photos and the story. I love your philosophy about travelling in your final sentence. Meeting the locals is so important. Yes, it is a birder’s paradise. Birders always like to have lots of different bird species, and especially ones we haven’t yet seen; so we had all of that, and much, much more. In addition, one of my favorite parts is meeting the locals, something I know you enjoy in your extensive travels too. My warm thanks, Draco, for your visits here today. So fun to have you join us in Trinidad, Doda. I remember well your recent photos of Bali and the colorful tropics you visited, and there is much similarity. 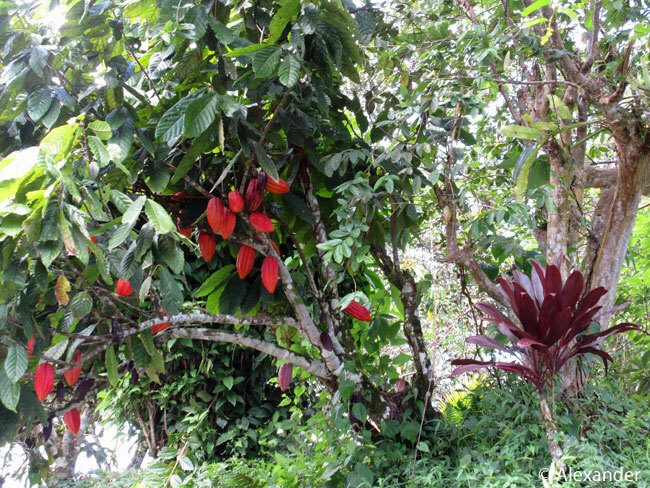 Isn’t it fun to see the cacao pods? Our guide in Belize climbed up a tree and retrieved a ripe yellow pod and opened it for us. He said they did it all the time as kids there. He had to take his shoes off to climb the tree. So glad you enjoyed the Trinidad tour, thanks so much for your lovely visit here. I was born in Trinidad and didn’t realize the beauty of ASA Wright until I migrated to the USA and brought friends back for a visit. Sometimes jems are waiting in our back yards to be discovered.